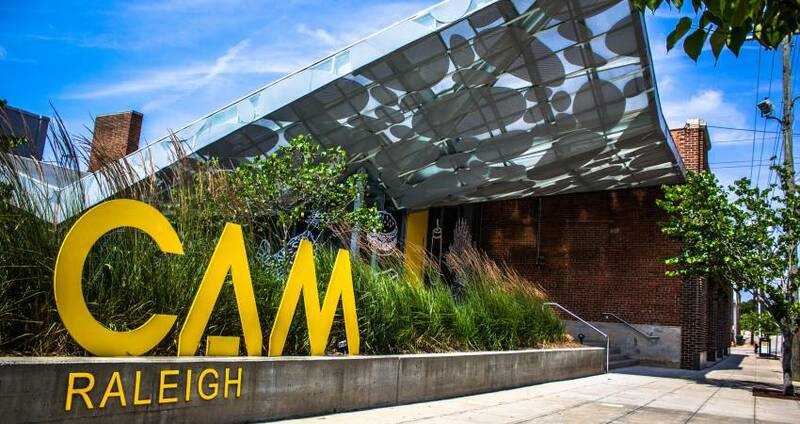 Located in the heart of downtown Raleigh&apos;s Warehouse District, CAM Raleigh provides beautiful event spaces that inspire—breathtaking architecture and art, tons of natural light, a spacious meeting area, exceptional service and more. CAM Raleigh is the perfect place for celebrations, weddings, photo shoots, live music events, special events and meetings. The gorgeous main gallery, at 4,000 square feet, can accommodate up to 350 seated guests, and the two-level facility as a whole can accommodate up to 800 guests for an event. CAM also strives to be a truly accessible venue and is part of a learning community of 11 local arts organizations that collaborate to advocate for and improve access to the arts for people with disabilities. All facility galleries, classrooms and restrooms are wheelchair accessible, the front door to the facility has an entrance ramp and the main entrance has an elevator. Upon request, ASL, audio description, braille, large format brochures, touch tours and specialized tours are offered. You can learn more about the museum and executive director Gab Smith here and also in this video!